Real rose petals, now with a very long shelf life! 52 colours, 100% organically decomposable! Keeps longer than 1 year! Now with more than 10 colours! Freeze-dried rose petals and Preserved rose petals are real rose petals. Modern techniques utilized by Sweet Colours make it possible to enjoy this natural product for much longer. When freeze-drying, all the moisture is removed from the rose with the aid of special machine. Due to this unique process, the rose petals retain their natural colour, cell structure and shape. Preserved rose petals are treated using an advanced technical process. The natural sap in the rose petals is replaced with a mixture of glycerine, water and colouring. Due to this, the natural and silky soft qualities of the rose petals remain in tact, just as if they were freshly plucked! All our rose petals are 100% organically decomposable. Sweet Colours' Preserved roses have a wonderful natural beauty. A product that feels just like a freshly plucked rose. It looks natural and lasts for more than 1 year. The secret? Actually, we stablise the growing process. The natural sap in the roses is replaced with a mixture of glycerine, water and colouring. 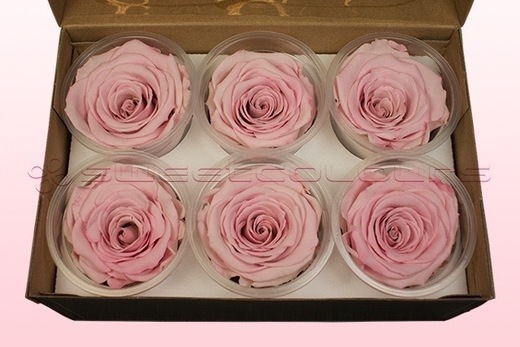 Due to this, the rose keep its natural softness, beautiful bright colour and silky soft shine. Thanks to their elegant and chic appearance, freeze-dried hydrangea petals are an attractive addition to every wedding or event. Would you like to see/feel what freeze-dried /preserved rose petals or hydrangea petals actually are first? ’Order a free sample package’. Rose petals: the epitome of romance! Scattering rose petals is a centuries-old tradition. It is considered to be the ultimate symbol of romance and luxury. Rose petals can transform your wedding location into a romantic spot straight out of a fairy tale. They can be used as decoration or to toss over the happy couple. We've done away with the tradition of scattering rice. 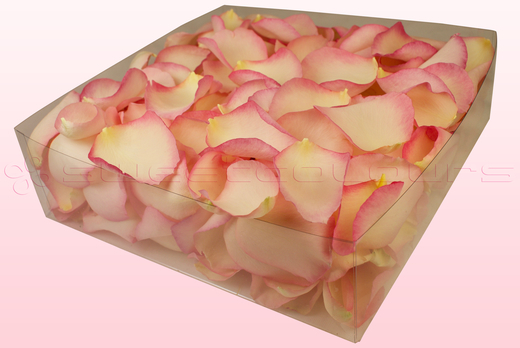 The simple reason: rose petals are much happier, more beautiful and provide more atmosphere. The message behind the tradition, however, remains unchanged: it conjures associations of fertility and wealth. Visit our website to find out everything you ever wanted to know about rose petals – colours, types and even useful tips. Colour selection: Will it be Cherry, Chocolate or Champagne? Now that sounds delicious! A range of exclusive flavours, but not for tasting – this treat is for your eyes only. 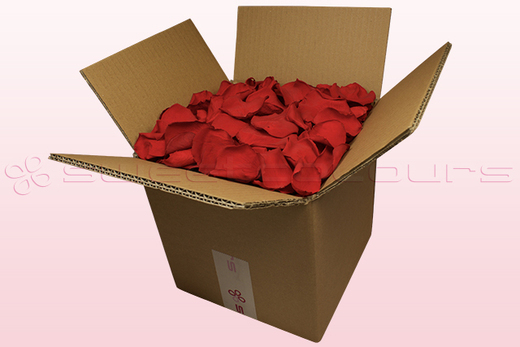 We have rose petals available in a wide spectrum of colours. In fact, we stock 52 unique shades of rose petals. From pale yellow Champagne to vibrant pink Fuchsia, or even an orange shade of Peach. Or would you prefer the classic luxury of red rose petals? Each and every kind has its own unique look and feel. For example, we carry not only solid-colour petals but also petals with shading on the edges: two colours in one. Bright, vivid hues or soft pastel tints, you decide which atmosphere you'd like to create. White, pink and red rose petals are frequently-chosen colours. But what do they mean? White stands for innocence, for purity and truth. White rose petals represent a new beginning full of hope and respect for one another. Pink, on the other hand, stands for admiration and joy, while red is the colour of true romance. By choosing red rose petals, you are showing that you love and value one another. 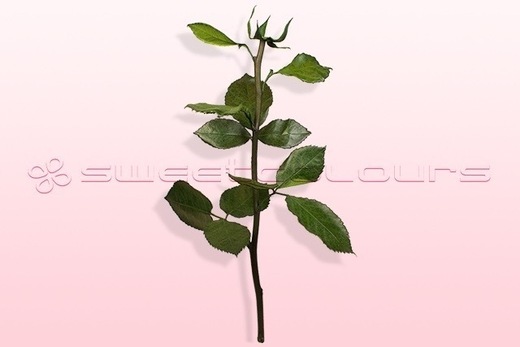 Two different methods can be used to treat rose petals in order to make them last longer. Freeze-drying is the most natural way to preserve roses. This technique extracts the moisture from the petals. As a result of this unique process, the petals are 100% biodegradable and retain their beauty much longer than fresh, untreated rose petals. If stored in a dry, dark place, they will keep as long as several months – without losing any of their quality or colour intensity. When rose petals have been ‘preserved’, on the other hand, they can be kept for years. Despite having been processed, the petals retain their silky-soft feel. The shine and colour stay as brilliant as ever and the petals will not wilt. ‘Preserving’ involves replacing the natural fluids in real roses with a special liquid solution. Please be aware that, unlike freeze-dried rose petals, petals that have been preserved may transfer some of their colour to other surfaces. Decide how many petals you need. This is the final step. You have already selected the colour and purpose, but how many rose petals do you need? A 1-litre volume of rose petals contains approximately 150-200 individual petals, depending on the colour and size. The weight of the petals is also a factor. Freeze-dried rose petals, for example, are lighter than preserved ones. You can use rose petals in any number of creative ways: as a table decoration, in confetti bags or to scatter along the path to the altar. Want to find out how many litres of rose petals you need? Use our 'rose petal calculator’. to find out! 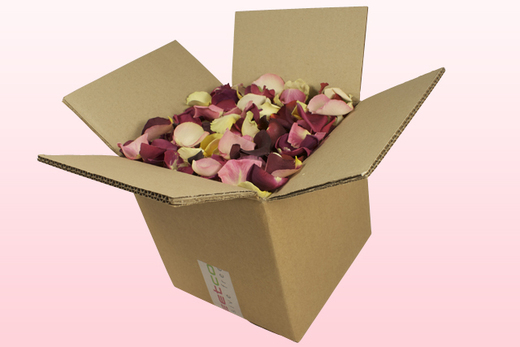 Just select four different colours of rose petals and we'll send a sample pack to your home! This way, you can easily see and feel which petals best suit your personality. All we ask from you is a small contribution towards the shipping costs (£1.99). The sample pack fits through the letterbox, meaning there’s no need to to stay home waiting for delivery. The more petals, the greater the savings! You can save up to an incredible 20%. When you order two or more products and spend more than £100, you qualify for a discount. Shipping costs will remain a fixed fee, no matter the size of your order. And when you place your order before 3 pm on Monday through Friday, your order will be shipped the very same day!